Two pieces of information preceded my screening of The Big Sick, Kumail Nanjiani and Emily V. Gordon’s adaptation of their real-life, unconventional love story, and I’m afraid those two pieces of information ultimately impacted my enjoyment of this quite lovely, quite wonderful, modern romantic comedy. First, I’d come across Nanjiani’s own twitter thread articulating his particular adoration for legendary romcom writer/filmmaker Richard Curtis (Four Weddings and a Funeral, Notting Hill, Love, Actually, and on and on…). I, too, am a massive Richard Curtis fan, having ugly-cried my way through About Time and realizing with delight that my favorite Doctor Who episode is one from his own pen (which, duh. It’s so good, it has to be his.). Curtis has a knack for tugging at heartstrings, and in a way that is entirely noble. It’s never cheap or dumbed-down (well, ok – he did adapt Bridget Jones’s Diary, but not the sequels!). It’s human, and often bittersweet – even painful – much the way real life can be. Decades later, his stories still resonate as some of the best in modern cinema. I read Nanjiani’s tweets with giddy anticipation. If this filmmaker is as smitten with Curtis as I am, surely his movie will be just as nuanced and moving! Expectations were categorically and sufficiently heightened. The second bit of info I had on the film I must admit at the outset I’m not entirely sure is true. But I’m pretty sure it is. I’d heard it and hated to hear it, and when I tried to independently refute it, I could not. You see, the film is set in Chicago…which, wonderful! That’s awesome! We love Chicago-set movies! Sadly, what I’d heard was that despite this setting, it was not actually filmed in Chicago. Ouch! Sure enough, no filming locations are listed on IMDb, and I can find no record of local filming permits on the city databases. This irked (and continues to irk) me, and though I don’t hold it against the filmmakers and producers (I imagine schedules and budgets had to do with it), it’s always a bummer when the city can’t play herself in a movie (even when she’s front and center on the poster!). This bit of intel meant that I was watching the film with a keen eye to setting, looking perhaps too closely for hints that anyone not from Chicago (and without said intel) would never have noticed. Grocery shopping at a Fairway? I’m not mad about it. I love me some Fairway, could probably still find my way around the one at 25th and 6th. But we don’t have those in Chicago, friends. Thin-crust pizza cut in triangle slices? Amateur move, folks. Everyone knows Chicago thin-crust pizza is cut in squares. I’m sure, unfortunately, that both of these bits ultimately kept me from leaving the theater as the immensely satisfied connoisseur of the romantic comedy I wanted to be after seeing it. That’s not to say it isn’t a really great flick. It is! And honestly, you should see it. It really is a charming, contemporary take on love in the late 2010s. It just isn’t THE charming, contemporary take on love in the late 2010s, which was what I was hoping for. I laughed a bunch (like, a bunch a bunch), and clearly Nanjiani and Gordon put all they had into making the movie (with a little help from producer Judd Apatow and director Michael Showalter, who’s better known for his raunchy comedies than nuanced love stories). Nanjiani essentially plays himself – he’s Kumail in the film, from an immigrant family trying to make his way in the comedy scene. He meets Emily (Zoe Kazan) at a show one night when she flirt-heckles him, and their relationship takes off from there, despite it catching both of them a bit off guard. It’s that uncertainty, and maybe a bit of the endemic grass-is-greener syndrome in technology-infused dating, that sees them break up. 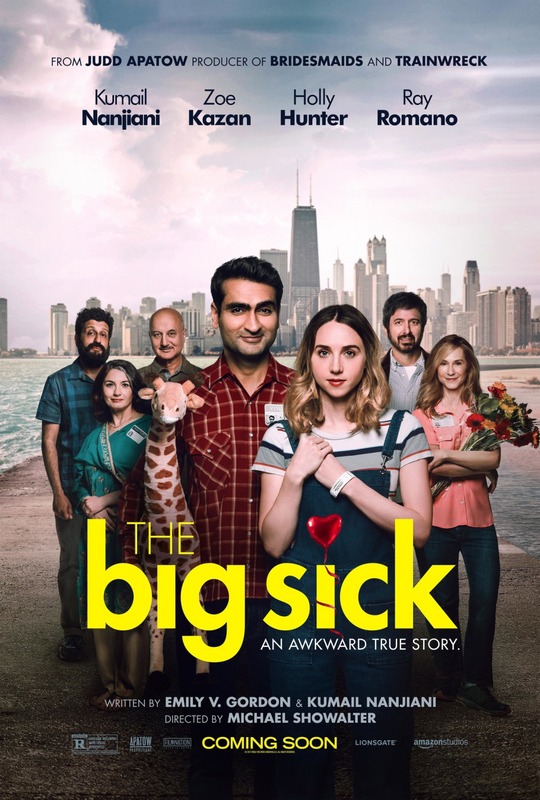 Shortly thereafter, Emily becomes gravely ill, and with family on the other side of the country, Kumail steps in to oversee her care until they arrive. Once they do, the film shifts gears slightly as Kumail navigates his role as doting son with parents who don’t even know Emily exists, and his role as ex-boyfriend now that Beth (Holly Hunter) and Terry (Ray Romano) are in town. Hunter and Romano turn in top-notch performances, a lucky get for this little indie, and their backstory provides a convenient parallel for the bumpy road Kumail and Emily traverse. Comedians Aidy Bryant (Saturday Night Live) and Bo Burnham (and a cameo by David Alan Grier) keep the funny going during comedy club scenes, and Bollywood legend Anupam Kher (with over 400 credits to his name!) adds authenticity to the immigrant storyline. To that end, in one particularly moving scene, Kumail asks his disappointed parents, who’d wanted to arrange his marriage, why, if they didn’t want him to live an American life, they brought the family to America at all? It’s a timely theme that doesn’t get enough attention, so concerned is the film with hitting cute relationship notes. It’s no spoiler to say that Emily makes it out of her illness (this is, after all, the real Emily’s story, and she’s alive and well), and the romcom proceeds along its predictable path. And that’s where a script consultation with Curtis might’ve paid off. In an effort to side-step romcom conventionality, the film plays with viewers’ expectations in the final third, taking us down the path of cliche and then dodging at the last second. I get where they’re going with this; where’s the fun, after all, in just giving in to all those stereotypes of the genre? The fun, it turns out, is in giving audiences what they want, in boldly modernizing the storyline while maintaining the tried and true plot points that have made the genre – when done well – the essential that it is. Here, instead, it all gets a bit exhausting, and ultimately the payoff the film does settle on seems…limp. Such build-up, engaging and entertaining as it is, deserves a grand gesture of a conclusion, a moment to truly revel in. It can be argued that the final scene is a grand gesture. It’s just that by the time it’s revealed, it’s such an afterthought that it just doesn’t play that way. A bummer for romcom groupies everywhere.